Am I a hipster? OH golly! I might be…especially since I’m currently growing a beard…and generally go against the grain…and don’t care…and I have a liberal arts degree!…and read constantly…and work in tech…and raise chickens. Oh shoot! But I don’t wear tight-fitting clothes, don’t wear pretend glasses and I keep my hair short. Oh, and I don’t drink coffee for a meal. Whew! Before I get going, please understand this is a post about eating animals and recognizing the usefulness of livestock in reshaping and healing our environment. With me? OK. Let’s go. A friend forwarded me a link to an article about the tragedy of backyard chickens ending up in animal shelters, blaming hipsters for this trend and somehow claiming that there just isn’t enough land in the world for us all to eat meat. I have so much to say about this article I’m not even sure where to begin. I want animal shelters to remain empty and unused. Unfortunately, biology crossed with irresponsibility (or accidents) means a lot of cats and dogs are born unwanted or have with quirks or defects that make them hard to keep. I truly and deeply sympathize with this issue and am currently working on a deal with a vet to have all of the barn cats fixed (all 18 of them) knowing it will probably cost me a small fortune, knowing those cats will never find homes, and knowing they will each, in turn, become a tasty snack for a passing owl or coyote or the victim of a brutal territorial fight with a feral tomcat (it’s a rough life on the farm). But, never fear, more unwanted kittens will be dumped on the road past my house and will find their way here. I’ll have them spayed or neutered too. Scratch soil and eat bugs. This is a big deal. Fewer bugs, better incorporation of nutrients, good times. Now, any old bird can scratch, snuggle, poop and be killed for soup. Snuggling (and swimming(I really hope that lady is an actress)) may be unique to an individual’s perception of a relationship toward a specific bird but egg laying requires something else. You have to have a hen, not a rooster. You have to have a young hen. As they get older hens lay fewer, but larger, eggs. Just as there are few pre-menopausal 90 year women, there are few 9 year old hens laying eggs. So that takes us to the next step. Either cut her throat, pluck her feathers (harder than you would believe), and dress her out (looks nothing like a store-bought bird!) for soup (cause she’s too tough to roast) or you sell her to someone else willing to do that work. As a third option, as presented by the article linked above, you send the chicken to a chicken retirement shelter. Sigh. Now, look. We tend to anthropomorphize our dogs and cats. I get it. I even do it myself. Reggie, our dog, is part of our family…even if he sometimes pees on the couch. I will never eat Reggie. Reggie’s entire purpose in life is to provide companionship. When we hired him, that was the job: love my kids. He does a good job of it. When he dies we’ll bury him out in the pasture with the other dogs and remember him fondly. To get love from Reggie I have to treat him well, feed him and protect him. He may provide protection himself but …well, probably not. If, in return for the care we give him, Reggie decided to attack my children the arrangement would change. We would probably change dogs. Now, compare that to a chicken. I (and I suggest most suburban chicken owners) want eggs. To get eggs I have to provide feed, water and protection. To give eggs the bird has to be young. I may feel some level of attachment to a hen and that may make me willing to continue caring for her as she becomes older. I may feel she has a “right” to live out her life after faithfully giving me 400 eggs in 600 days. That’s fine…except I probably originally got chickens because I wanted eggs, not to gather more pets. In most towns you are limited on how many birds you can keep. And you want eggs. Besides, she has value after she finishes laying eggs. We should always put our resources to their best and highest purpose…she tastes good. So I, as a suburban chicken owner, would raise her replacement and make soup or sell her to someone else who wants soup. As a closing remark, the article states, “there just isn’t enough land for all the meat, dairy and eggs we want to eat”. Sigh. This ties into my next point. Livestock (and pets) can, and should, be used to enhance the environment they are kept in. 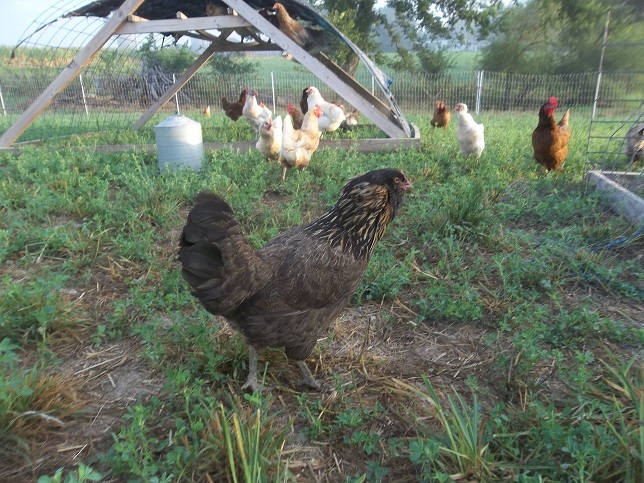 A chicken can quickly enhance soil fertility and plant diversity but it can also quickly overload the soil with nutrients, cause runoff and stink up the neighborhood. Same with a dog. Same with a cow. Same with a pig (and I think suburban folks would be much better off raising a pig than a chicken but that’s a conversation for another day). It’s all in how they are used. But God help the vegetarian who wants to cycle nutrients in the absence of consumable livestock. I can raise a cow per acre on sunlight and rain. I don’t need to use petroleum to rip soil, plant seeds, cultivate, spray (even organic sprays) then harvest, dry and transport. Nope. I just graze the cow until it weighs enough…or I milk it each day and sell, raise or eat its offspring. Beef raised on harvested sunlight without fossil fuel should be cheaper than chicken. It’s the kind of thing we should raise in zones 3 and 4 if you can think of the city as permaculture zone 1. Produce should be grown in the city so you can have a nice salad with your beef after we walk the cows to town for slaughter. How much land do we need to cultivate for annual crops? Once you cut out 70% of the corn crop that is grown for livestock feed and whatever is wasted on ethanol production how much land do we really need? Not a whole lot…less than 3% of the available land (the current residential lawn space). All we have to do is convert a portion of our lawn space into productive garden space, put up some high tunnels, let cows eat grass and walk the cows to town for slaughter. Then you can graze co-owned dairy cows on what remains of your urban lawn space and raise your own chickens on your kitchen scraps. Now, that’s a pretty extreme simplification but I think it’s more realistic than assuming it’s simply not possible. It’s not sustainable under the current agricultural paradigm but it’s entirely possible (and ecologically beneficial) for the world to eat meat. You might even take a page out of Will Allen‘s book and eat fish with your salad. So, go get yourself a chicken or two and help save the world…even if you’re not a hipster. Our oldest daughter stuck with the bean picking for an hour Tuesday morning. Then she screamed, “I’m Done!” and ran into the house crying. This is not what we want out of our children. Did we push her too hard? Was she simply having a bad day? Probably a little of both with a dash of older brother tossed in. It’s the hottest weather we have had all year, we have pigs again, broiler chicks, pullets we hatched out, young rabbits, stupid ducks, layers, cows and a 40′ row of beans. Not to mention the tomatoes we are simply ignoring. The workload is taking its toll on everyone. That’s why we only plant beans every few years. 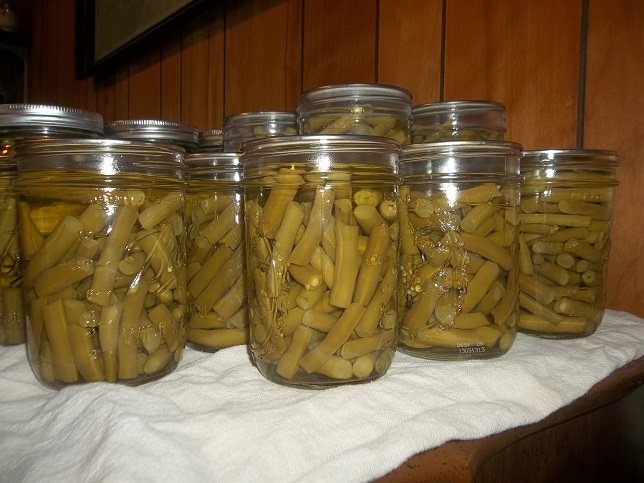 Anybody else risking your children’s sanity or skirting divorce by canning beans this year? One question is on a constant loop in my mind. It doesn’t matter where I live, what I am doing or how I am feeling. One question assaults me moment by moment, day after day…year after year like the drums heard by The Master in Dr. Who. The question doesn’t even refer to a specific activity. It just hangs there…pestering me for an answer. Why do I go to work? Why do I like steak? Why are hot dogs better than bologna? Why? I have beaten the budget to death with blog posts attempting (with varying degrees of success) to justify my farming habit. Behind the scenes I have been scouring books, talking to friends (really pestering Matron! ), and thinking. My father walked an empty, desolate barnyard, listening for the long-ago songs of life. He heard only a loose sheet of tin roofing, curled over, scratching itself distractedly in the wind. He cried. He cried because he no longer had the energy to keep the barn full of life himself. He cried because none of his children were willing to fill it full of life again. He cried because he could not die here on the farm amidst life, as his forebears had been able to do, but might soon, too soon, have to shuffle off to the country home like his urban counterparts. That’s certainly part of the answer. I want to be surrounded by life! We’re a little busy right now, as is everyone else. Here are a few pictures of things we’ve been busy with. 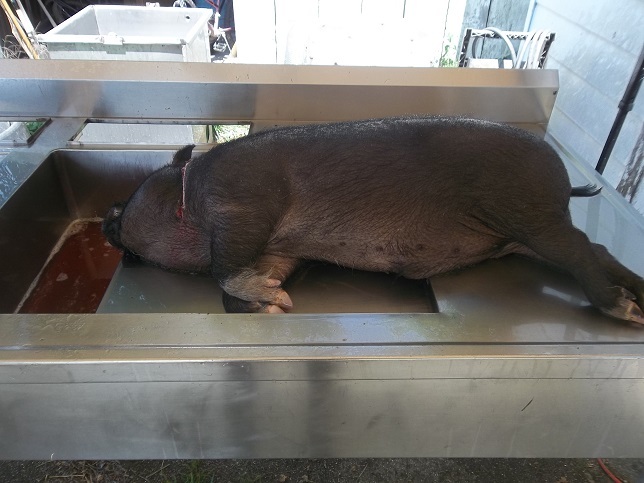 My sister raised a potbelly pig in her back yard. We introduced it to the freezer. He was an uncut boar. I’ll say it was an interesting culinary experience. I had not scraped a hog previously. I regret scraping this one. We tried mason jar lids and a torch. Mixed results. I suspect my scalding method could be improved. 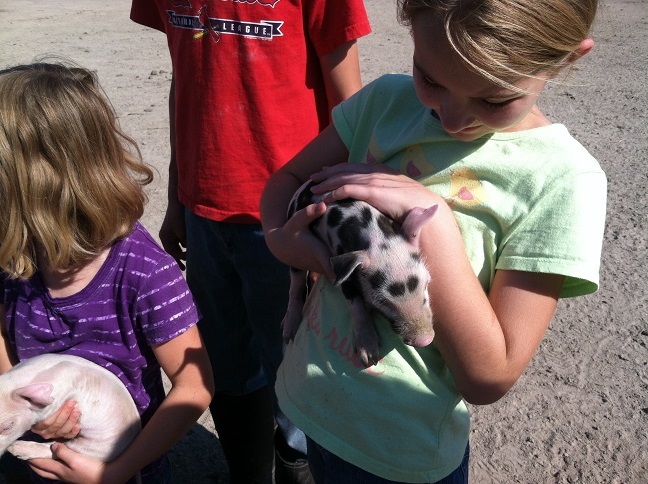 It reminded me it was time for us to get some pigs of our own. These should be ready in late November or early December. Get your order in now. 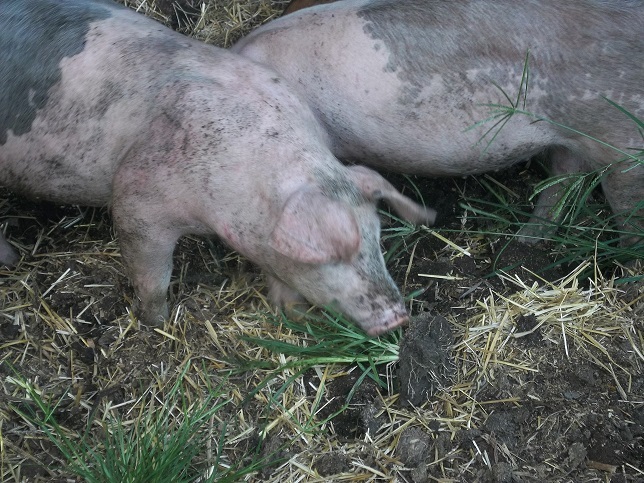 The pigs were hungry for grass and had a great time digging through last winter’s cow bedding. We are busy canning beans, peaches, tomato sauce…you name it. As time allows we put a few ducks in the freezer. It’s pretty hard work. A chicken takes us about a minute, a duck takes about 10. The extra step of waxing the bird makes it come out clean but adds a lot of time to the process. Here we are peeling the wax. 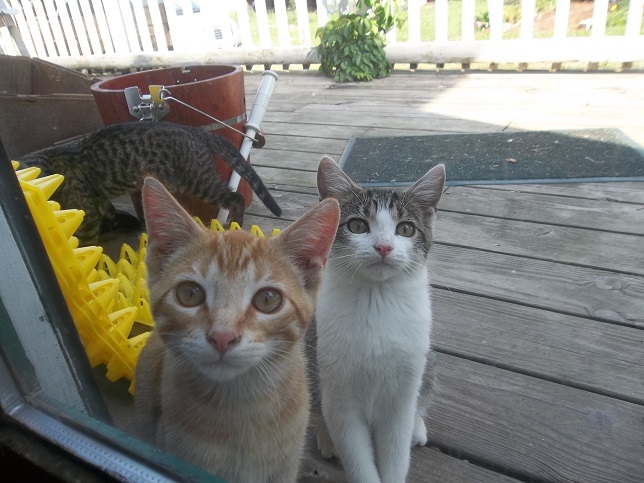 And always the kittens are watching us…looking for a hole in our defenses…wanting to invade our home and love us to death. The kittens fail to realize that I enjoy them but do not love them. That was a distinction my grandpa tried to explain to me when I was younger. I understand it now. More on that another time. A: That’s a great question, self. I’ll tell you. First, because I’m lazy. Cows don’t need much in terms of time or inputs. 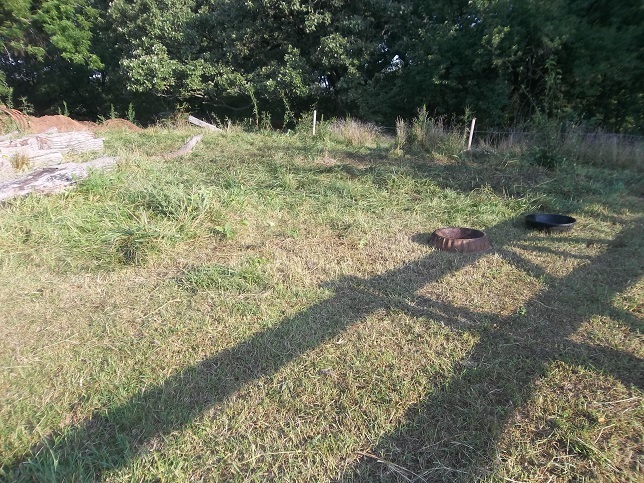 No feed grinding, no extravagant fences…just grass, water and wire. Second, because I don’t want to mow (see Lazy) and need a way to cycle nutrients. Q: So what does that mean in terms of annual revenue? Go ahead. Answer me as if I’m naive. A: That’s not such an easy question to answer. We have gone over some of this before but let’s do it again. I’ll try to break this out a little bit to make the math easier and I’ll go ahead and make it personal…ish. Let’s assume I have 1 cow per acre on my 60 acres. I could, on average, sell calves for $1.55. (Now look, I know calves are selling for $2 right now but that’s largely because corn prices fell and feedlots are buying calves again. Prices change. Stick with the $1.55.) That’s $697 for every 450# calf I sell each year. Not all 60 cows are going to calve. Let’s say we average 54 calves at weaning. 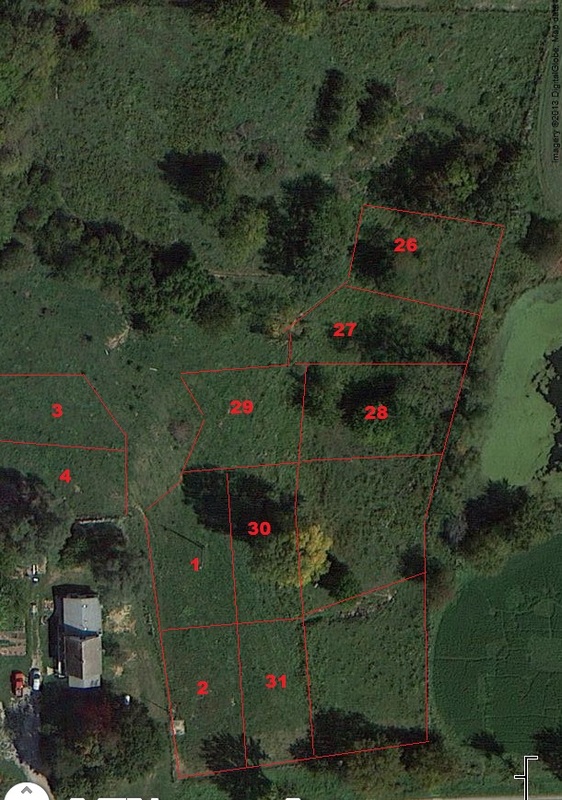 So we’re looking at $37,665 of income if the weather is perfect and I’m completely stocked on my 60 acres. But still, that’s gross and I have to keep 6 heifers (-$4,185) as replacements, selling 6 open cows(+$6,000) taking us to $39,480 of gross income. Cows don’t need much but they do need a little. They’ll need salt ($5/head), minerals ($50/head) and hay ($100/head if we feed for 60 days) and will have to pay for the ground (pasture rents around here for $50/acre…just happens that we get enough rain to support 1 cow/acre). Then there’s a cost for my labor (8 hours/week priced at minimum wage divided over the number of cows in the herd…not much difference in labor for 6 cows and 60 cows but it’s $7/cow at 60 or $70/cow at 6). That all roughly adds up to $212/cow/year for 60 cows. Gordon Hazard says to add in another $100 for vet bills and hope it goes unspent. That takes us to $312 per cow per year or $18,720. With gross income of $39,480 and expenses of $18,720 (we already accounted for kept heifers worth $4,185) we’re down to $20,760 ($346 per acre)…before we pay tax. Now, in truth, my farm expenses are higher than what we have accounted for but the cows, as an enterprise, command market price for pasture rent and don’t need me to own a tractor, build big barns or to watch cable TV. I could dream of charging my cattle business $20/hour for my time but they would fire me in favor of $7/hour labor. From a business perspective, I’ve outlined what a cow costs, not what a farm costs and certainly not what a family costs. My farm payment isn’t the cow’s problem. My lifestyle isn’t the cow’s problem. See the difference there? 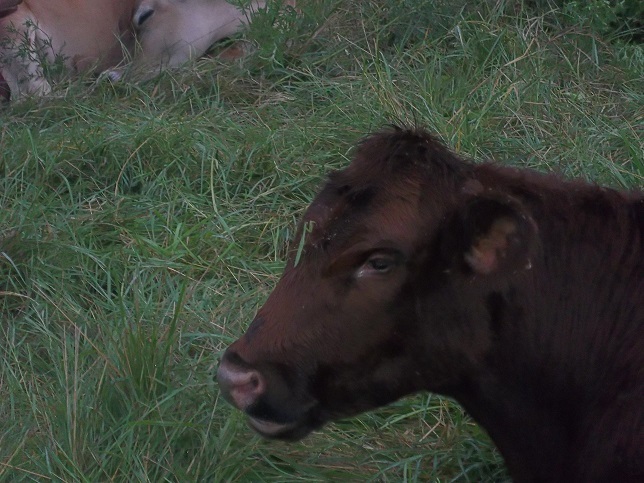 As a business unit, the cows can earn their keep…it just isn’t hugely profitable. So, again, after paying myself minimum wage to move cows (because we’re limited by the market, not my desires), the farm kept $20,760 from the cattle operation. That’s about a 6% return on the farm’s investment. 10% is a magic number. It’s high enough to attract interest in business, not so high as to attract too much attention. It’s enough to maintain fences and infrastructure, enough to help fund additional enterprises on the farm, and enough to help save up for a rainy day. But I’m looking at a 6% return…assuming I can keep my farm fully stocked. By the way, we’re not fully stocked. Now, to help out a bit, land ownership is separate from cattle ownership. Gordon Hazard says his cows pay him for pasture usage and all of that money goes directly into an account for buying more land, that he paid for the original land and herd with his off-farm work. That sounds familiar. The farm income is just enough to cover the farm payment each year. There is little left. I made $7/hour for working a little over an hour/day…but, after 30 years the farm is mine…along with a pretty nice herd of grass-genetic cattle. It is important that the land carries the debt and not the cattle as I can take the cows with me if things go bad. So the cows can carry the farm. Those cows don’t need much from me for that money…but it’s not a whole lot of money. And the income would not be steady, it’s highly variable. Some years I’ll need more hay. Some years I’ll have to sell stock to stand a drought. Then I’ll face a few years of reduced profits as I rebuild herd numbers. But the math seems to work…it’s just not going to make us millionaires any time soon…and I’m probably not going to quit my day job. Q: How can I make it better? A: Well, I can work to cut costs. That might help. A little. Going without hay would be a big boost…can you imagine if I had to feed hay for 120 days instead of 60? Maybe if I had permanent paddocks I could simply subdivide. Then I could spend less time building fence…but that only goes so far as my labor costs are already quite low. What if I grazed somebody else’s cattle and they bought the hay? Now there’s an idea. I’ll have to put a pencil to that. There are other enterprises I can pursue to add to the bottom line but pimpin’ eggs ain’t easy. Nothing is easy…and nothing takes as little time as the cows. Q: So is that it? A: I don’t know. I really don’t. I have customers asking me for pastured beef. I’ll have to raise some of those calves to slaughter weight. That cuts down on the number of cows I can carry but it enables me to de-stock my farm quickly during a drought. My revenue will be lower but I would be more flexible. Q: So, Mr. Steward, how long till you retire and farm full-time? 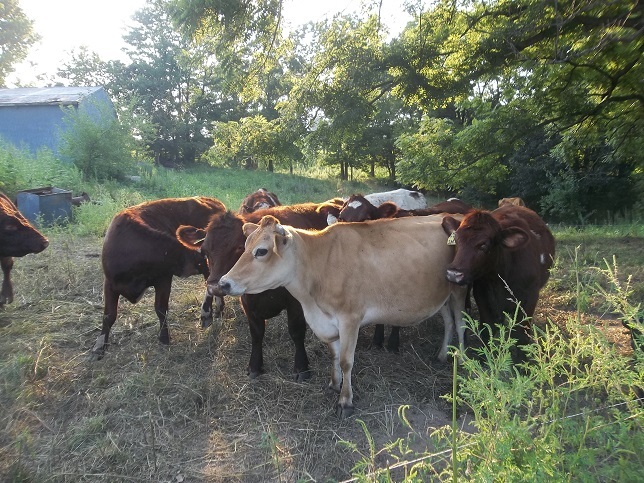 A: I think this all shows that cattle are not likely to be a primary source of revenue on my 60 acre farm but they are the primary tool we will use for nutrient cycling and the foundation from which our other operations launch. We work to run a truly diverse farm as the more uses I have for each acre, the more profit I can derive per acre. Add in timber, hogs, sheep, chickens and recreational value and we might start getting somewhere but something has to mow the grass. So we have our solar-powered lawn mowers that need attention for about an hour/day and pay the rent. So I guess that’s that. The cows will pay the rent and cycle the nutrients but won’t, by themselves, allow me to quit my day job…at least as long as I’m limited to 60 head. Now the hard part: Getting to 60 head! Notice the mowed area in the foreground. With me? 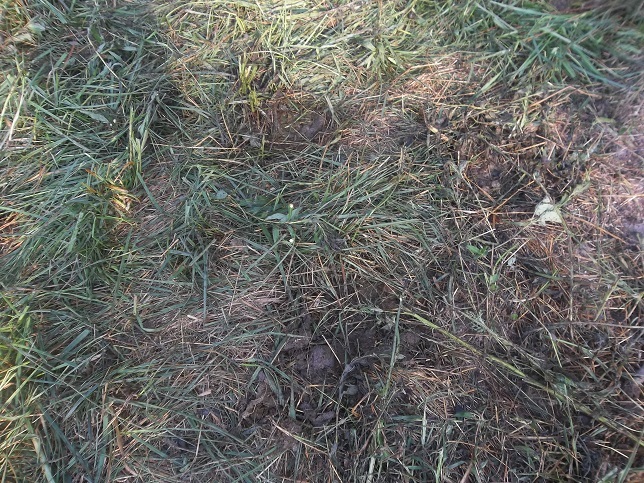 One of our goals in using cattle for rotational grazing is to cover, protect and feed the soil with litter. This keeps the soil cooler and traps more moisture than just bare ground. Where is the litter going to come from in the foreground? It ain’t. I mean, you would think some portion of the grass clippings would stick around and blanket the ground but there just isn’t enough mass…the soil biota eat through it too quickly. Not much for litter covering the soil. 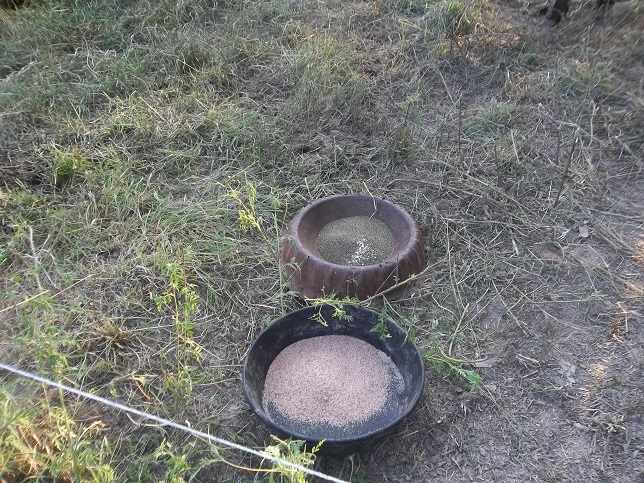 The cows ate it right down to the nubbins…horses would have eaten it to dirt. But the rest of the pasture looks pretty good. We had them packed in pretty tightly and we got good trampling and manure coverage. 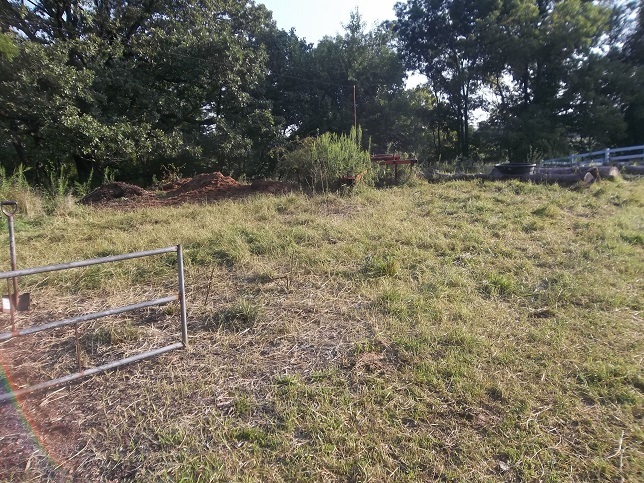 Again, there is very little left where the pasture had been mowed (a necessity for cemetery access). That area will be a little slower to recover. 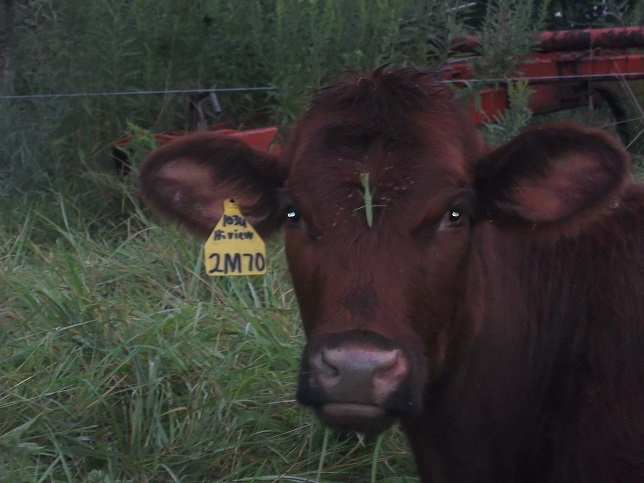 I expect the trampled grass to come back quickly…in time for fall grazing. Hopefully we’ll get to graze it twice more this year. 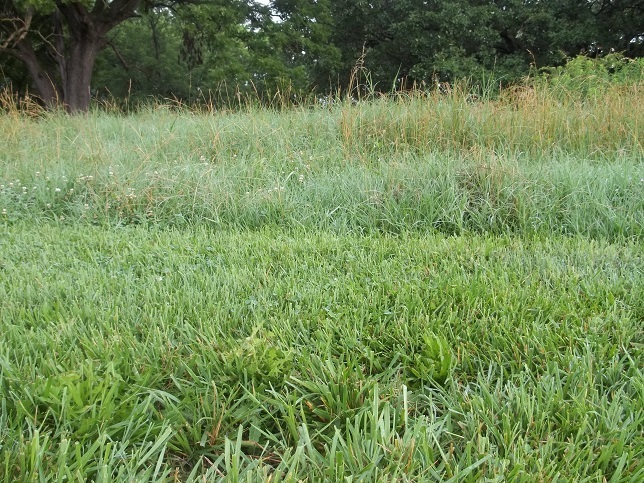 Most of the neighbor’s pastures look like the foreground in this picture…except they also have clumps of weeds. If they don’t they have been mowed. From the road they look OK just like this picture looks OK. It’s only when you go in close to investigate that you realize how damaging it is. 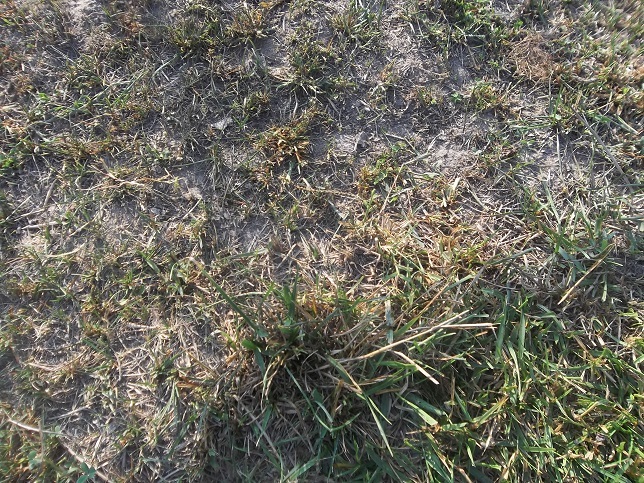 Hot, baked, dead earth is not conducive to future grass crops. I have to believe this is more than 1,000 head. These cattle are managed by Neil Dennis in Saskatchewan. Based on a presentation he did for PowerFlex fence that is posted on Youtube, he packs cows into a half-acre and moves them throughout the day, overnighting them in the larger area, then starts small again the next morning. To match his stocking density (1.3 million pounds per acre) I would start my 10 cows in an 18×18 area. 6 steps by 6 steps. Anyway, I think it’s just amazing. I can’t imagine what the neighbors would think if I took 1,000 cows down the road on a Sunday morning. Never have more cows than your wife can look after. Neil does a lot of testing to see what works on his land. It’s surprising which techniques fail to measure up to the propaganda on his farm. Oh, how plans change. If you look at this post, you’ll see the July grazing plan. It worked well to shade the cows on days well into the 90’s with heat index above 100. Right on schedule, on the 25th, we were grazing #25. Happy days. But the cows are on 1 and it’s the 14th. I gained two weeks. Where did it come from? Some of it was grazing the slope East and South of 3 and 4. 3 days were gained from grazing the unlabeled areas to the right. A big gain was grazing the edge of the pond. So, I’m doing fairly well. I gained 2 weeks because of the cool weather and the use of reserve ground. But is this all there is to planning your grazing? Just vague lines on a map? Well, not really. If we have to feed hay, where should it go? Where are the cows going to calve? What portion of the farm is set aside for drought? Planning to cut anything for hay? Will you allow a field to totally rest for a year? How is that specific area doing? Are we seeing increasing or decreasing plant diversity? Good carbon litter? Where will the cows find shade in hot weather? Do you have a plan B in case something unplanned happens…like prolonged rain and flooding or prolonged drought? How will you fence in the Spring, Summer and Fall and how will that change? How will you winter graze the stockpile? Where should stockpile remain to start the spring rotation again? But the questions don’t stop there. When was that family vacation? When is that friend getting married? When do chicks arrive? 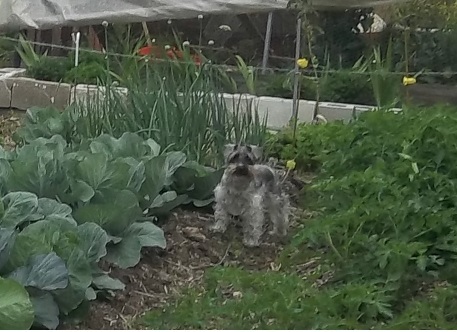 When do we usually plant the garden? When will we have to put up strawberries, blueberries, peaches, green beans, tomatoes or apple sauce? How are we going to build fence so we can conveniently work around social events, family plans and other farm work? I want fat cows and healthy pastures. This won’t happen on its own. I have to plan my way. Right now I try to plan a month at a time but in the near future I’ll be better at estimating and can shoot further out. One of the early chapters of For the Love of Land: Global Case Studies of Grazing in Nature’s Image reminded me of the pressing need to transition to year-round planning instead of just winging it month to month. Let’s complicate things further. 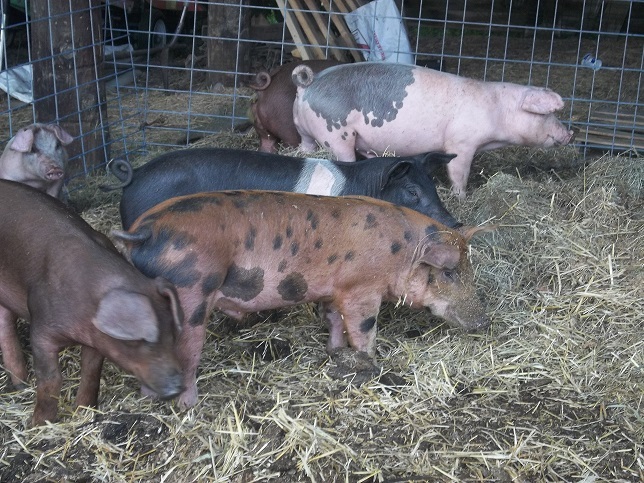 How many pigs will we pasture this year? Where will we run them? How can we coordinate their grazing with that of the cows? How about turkeys? Or broilers? Where do they fit into the rotation? It’s nice to add all that disturbance and manure but we have to allow recovery. Breakfast time in the bug world. I’ve never seen the like.